Take a hike on the Maddron Bald Trail from the Cosby area of the Smokies, and you will be thrust into a different age and time. With a restored 19th century cabin and old family cemetery along the way, and mature forest as your destination, you might imagine yourself walking the trail in the days more than a century ago when settlers built their homesteads here. 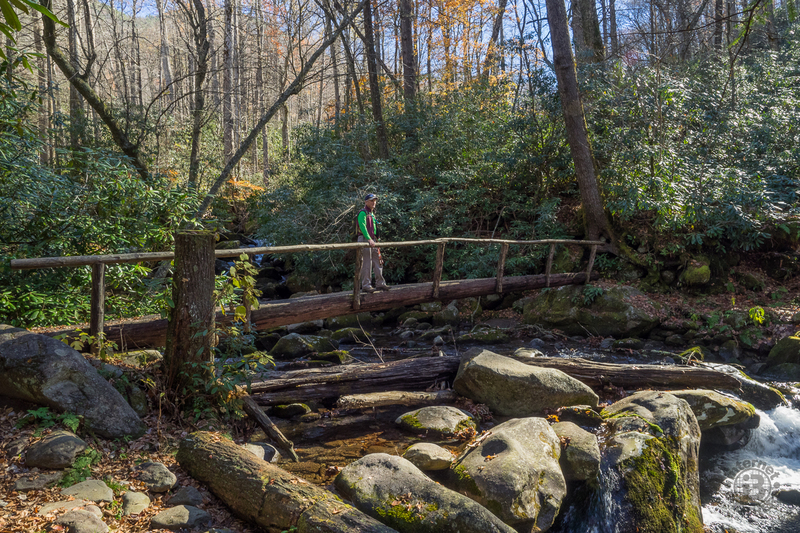 The trail provides access to Albright Grove, a patch of old growth hardwood forest that contains some of the oldest and tallest trees in the Smokies. Throw in a creek crossing on one of the Smokies famous footlogs, and you’ll have quite an enjoyable day. We hiked to Albright Grove on Tuesday, November 11, 2014 beginning at 10:30AM and ending about 2:50PM. Our plan was to take the Maddron Bald Trail to the Albright Grove Loop, then return. Hike Configuration: Up and back with a lasso. Blaze: None needed. Hike Rating: Moderate. Most of the way to the grove is uphill. Trail Condition: Very good. Leaf covered mid-autumn. Starting Point: Maddron Bald trailhead on Laurel Springs Road. Trail Traffic: We encountered five other hikers on the way back. How to Get There: From Cosby, TN take Hwy 321/73 west to Baxter Road and turn left. If you reach Yogi’s Campground, you have gone too far. Drive about a half mile past several houses and look for a sign on the right for Maddron Bald Trailhead. Take a sharp right turn and continue a brief way to the trailhead on the left. This was my first hike after more than a week in the canyon country of south Utah. While I missed the desert, it was definitely good to be back in the Smoky Mountains I have come to know and love so well. The Maddron Bald trailhead is right on the northern boundary of the national park, just a handful of miles west of the little town of Cosby. We had done hikes from Cosby before, including most recently on the hard but scenic Snake Den Ridge Trail to Inadu Knob. Even though it was well into November, I was hoping with the relatively low elevation that there might be just a little bit of Autumn coloring scattered about in the forest. Rarely does a visit to the Smokies disappoint, and on this day it didn’t either. While it was well past peak, there was still enough color to go “ooh” a few times. Our ears were filled with the continuous swish-swish-swish of our steps through the dried, fallen leaves. You never have to worry about surprising wildlife in the Fall. They can hear you coming a mile away. The trail itself is pretty much uphill all the way, but never steep enough to induce huffing and puffing. It is an old gravel road originally built in the 1930s by the Civilian Conservation Corps. Covered in leaves, we never even noticed the gravel. We were surrounded by beautiful hardwood forest and always green rhododendron. The first landmark of note comes three quarters of a mile up the trail when you reach Baxter Cabin. Built in 1889 by Willis Baxter for his son as a wedding present, Baxter Cabin is a one room home constructed entirely from the lumber of one chestnut tree. 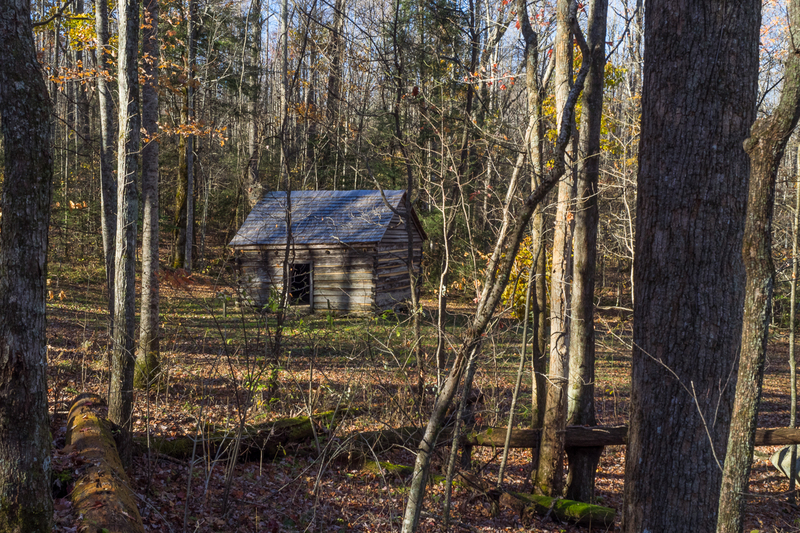 It is one of many 19th century settlements restored within Great Smoky Mountains National Park. The timing of the day and season had the surrounding trees casting very long shadows on the cabin as if drawing us closer and closer. It’s a pretty spot, one I’m sure the Baxter’s enjoyed waking up to each day. A nearby babbling brook offered water, and the forest provided shelter and sustenance. Another half mile beyond the cabin is a trail junction. To the left is Gabes Mountain Trail, a means of getting to the Cosby Campground without having to go all the way up and over Maddron Bald. On the right is Old Settlers Trail, one of the longest continuous trails found within the national park. It will take you to the Greenbrier section, but it’s a long, long way. Look for the waypoint on the GPS map below for the location of this large meeting of trails. A Maddron family cemetery is located near the trail junction. The next mile continues climbing the old CCC road, with all the senses of the forest in abundance. I kind of got lost in the moment with the sights and sounds, with taking pictures of the forest and the trail. When I glanced up I noticed my companion Meanderthal was nowhere to be seen. He had pressed quickly on ahead out of sight while I was adrift in the revelry of the Smokies. When I reached the end of the road where the trail continues as a single-track pathway, there he was patiently waiting. Once off the road, the trail narrows, becomes more rugged, and reaches the beginnings of the big trees. Keep your eyes peeled for the occasional hemlock or basswood, or the mighty tulip poplars that rise a hundred feet or more above you. Even the white pines are bigger than usual. 2.7 miles from the trailhead we reached, and crossed Indian Camp Creek. The footlogs used in the Smokies by the trail builders are always great fun, but watch your step. They are often covered with slippery algae, or even ice, but this one has a thin layer of asphalt to aid with traction. The Albright Grove Loop Trail is three quarters of a mile, and as the name implies, loops around the Albright Grove then returns to the junction with Maddron Bald Trail. It is recommended you hike the loop counter-clockwise. Don’t expect the largest of the old growth trees in the grove to be right along the trail. You need to look for them in the forest, even follow game or volunteer trails to get to their trunks. The trail climbs for the first half of the loop before leveling off. Near the point where it begins to descend, look for a small spur trail that leads to a giant tulip poplar on the left. It’s only a little way off the main trail to this largest tree in Albright Grove, one standing nearly 150 feet. My regular hiking pal Ken poses in the sunlight on the Indian Camp Creek footlog. Ken is one of the original Meanderthals and has been hiking with me even longer than I’ve been putting trail reports on this web site. They say this grove has some of the largest trees in the Smokies, and they certainly are big, but I have seen much larger trees in the Big Poplar grove on the Caldwell Fork Trail and the Boogerman Trail at Cataloochee, as well as along the Ramsey Cascades Trail in Greenbrier. Still, it is quite impressive. When we finished the loop, Ken wanted to continue a ways up the Maddron Bald Trail, so I bid him a temporary farewell and pulled up a seat at the base of a giant tulip poplar and enjoyed lunch. The Maddron Bald Trail climbs for several more miles, eventually crossing Maddron Bald of course, but continuing on to its terminus at the Snake Den Ridge Trail mentioned above. It is a means of accessing the Appalachian Trail at Inadu Knob. Past Albright Grove is the most difficult part, and Ken came back to report that he had been stymied by an especially difficult creek crossing that he didn’t have the gear for. In the meantime, I felt like Rip van Meanderthal. It was so comfortable leaning against the trunk of this gentle giant. I was listening to birds, and breeze, and thinking about the pioneers who settled here 150 years ago. I know my chin hit my chest more than once as I dozed in and out of my siesta. It is so easy to be lazy in the beauty of wilderness. I was fortunate to grow up playing in the woods as a youngster and still love it half a century later. Ken returned after 30 minutes to join me leaning against the big tree. He enjoyed his own lunch while we talked about the hundreds of miles of trails there are to do in the Smokies, and all the history and wilderness that surround them. Each time we come here, we give sincere thanks to all those in the past who had the forethought to preserve this exalted slice of Americana so that future generations will always be able to feel the calling as well. The return trip down the mountain, across the creek, back to the CCC road, and past the cabin is all a piece of cake. As they say, it’s all downhill from here. We passed a few other hikers beginning their trek as we were completing ours. We stopped at the cabin once more to look inside this time, and were thankful once again… for the creature comforts of modern society. Living in a single room log cabin with no utilities was far from what we are used to today. On the drive back to North Carolina we crossed the picturesque Foothills Parkway and caught some great color in the forest high above the valley. Only six miles in length, it is still a stunning roadway along the edge of the national park with views of many of the park’s most recognizable features. If you’re visiting the northern part of the Smokies, I definitely recommend you cross Foothills Parkway. To summarize the Maddron Bald Trail, if you really like hiking in the forest, especially among the big trees, give this one a go. It’s easily a four season trail. Perhaps watch for ice in winter when crossing Indian Camp Creek, but otherwise it’s easily doable any time of year. This one is also one for the whole family, so be sure to bring the little ones along with you. With almost 1,500 feet of elevation gain it’s great exercise too. Your body and mind will thank you.